While standing behind the demo for Papo & Yo yesterday at a Sony event, watching the game in action as I waited for my turn to play, the first thing I noticed was that the main character doesn't walk up stairs. He just sort of glides. So when I got my hands on the controller, the first thing I did was walk up to the stairs and see what sort of weird glitches I could create. A few seconds later, my character's feet were hovering in mid-air. "This isn't a final build," the PR representative said quickly. I didn't really care. In fact, this sort of janky animation fit the game perfectly. Papo & Yo isn't a high-polished action game or a smooth shooter. It's a puzzle game developed by a small team of designers who have crafted an experience that feels like walking through a surrealist painting. 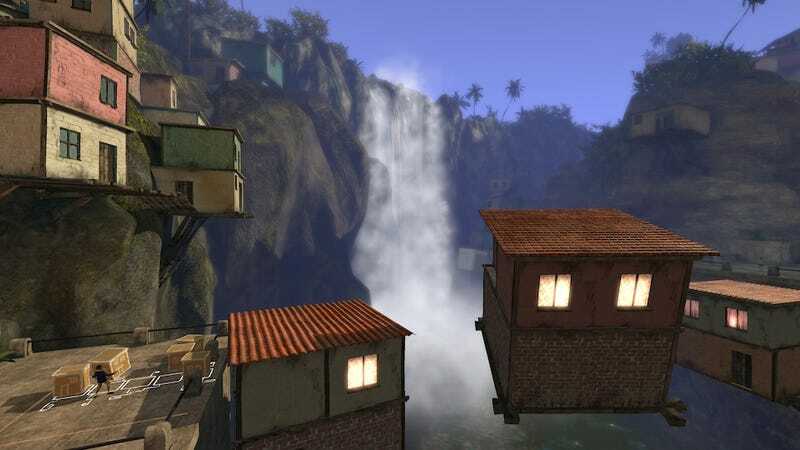 In Papo & Yo, you play a little boy in a fantasy world that resembles a South American village. You chase a girl and you meet a monster and you hover in the air with the aid of a flying robot. You pull on white chalk drawings of levers to turn them into actual levers that make box-like homes spin and glide like a giant mechanized Lego set. And you climb and hop through rooftops, caves, and giant pulsing waterfalls to hunt down a girl who you'll never quite catch. Maybe you've already read about creative director Vander Caballero and how his inspiration for Papo & Yo drew from his troubled childhood. You should definitely watch Evan's video coverage of the upcoming PlayStation 3 game, which will be out on August 14. But what you should really know about Papo & Yo is that it's the type of game in which you won't mind weird animation glitches or janky movements. It's a game in which houses will float in the air and frogs will make a friendly monster turn into an abusive demon.